A curious coupling this, bringing together major works from the beginning and end of Enescu's creative career. His technical skill as a composer is just as evident in both works, but the intervening years, between the 2nd Symphony in 1912 and the Chamber Symphony in 1954, made him the distinctive musical voice we think of today. When Enescu composed his Second Symphony, he was an itinerant violin soloist, visiting many of the cultural centres of Europe. This may explain the many musical influences pulling the music in all sorts of different directions. When Ensecu writes swooning Romantic music it sounds like Rachmaninov, but when he's being more restrained he sounds like Elgar. A French accent can also be detected throughout much of the piece, while its sometimes terse thematicism leans towards Brahms. But it all holds together, thanks in large part to Enescu's skills in melodic contouring, efficient counterpoint and colourful orchestration. The use of percussion, both tuned and untuned, is particularly imaginative, but is about the only forward-looking aspect of this otherwise resolutely 19th century piece. The Chamber Symphony, in contrast, is clearly a product of its time. The title suggests influence from Schoenberg, but the connection is difficult to pin down. Like Schoenberg's Chamber Symphonies, this piece makes a musical virtue of its ability to produce symphonic textures from limited instrumental means. Piano and trumpet often dominate the textures, and there are also a number of appealing flute solos. This is the music of an old man: Enescu was in his 70s when he composed it and is was to be his final work. But you get a sense of a lifetime's musical experience being distilled into this concise score. It's not as flamboyant or overt as the Second Symphony, but it's just as attractive. Conductor Hannu Lintu finds the ideal tone for both works with his Tampere forces. The playing is lively and inspired, and the ensemble and balance are excellently controlled. 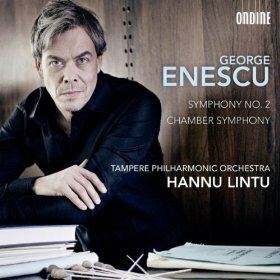 Lintu doesn't go in for excesses of rubato or dynamic extremes, and the Second Symphony sometimes feels a little repressed as a result. It's the right approach for the Chamber Symphony though, where precision and clarity are all. The Ondine label had been dabbling with SACD before the company was taken over by Naxos a few years ago. It looks like that has come to an end, which is a shame. The sound quality here isn't bad though. A bit more bloom on the string sound could benefit the Second Symphony, and some sections of the winds sound a little distant. Otherwise this is an attractive release. Erudite liner notes from no less an authority than Jim Sampson act as a welcome guide for those of us who don't know our Enescu quite as well as we might. It is clear from this disc that his symphonic music deserves wider recognition than it is currently afforded.